NETWORK FINALS: THE GOLDBERGS, CHICAGO PD, SURVIVOR and CRIMINAL MINDS all gained 0.1 in final numbers. CABLE HIGHLIGHTS: ESPN’s NBA doubleheader had both of the top slots on Wednesday cable, but the late Golden State vs. Clippers game at 1.18 was nearly double the score of the Knicks vs. Chicago game at 0.63. On Lifetime, the night started with LITTLE WOMEN ATLANTA down a tick to 0.53, then LITTLE WOMAN LA was up 0.07 to 0.62, and 2 episodes of TERRA’S LITTLE FAMILY returned at 0.47/0.42. MTV’s CATFISH returned with a regular and not “special” episode at 0.52, and with that lead-in, SUSPECT rebounded by 0.11 to 0.31. On TLC, MY 600 LB LIFE put on 0.08 to 0.48. On Comedy Central, BROAD CITY slipped 0.03 to 0.34. VH1’s FAMILY THERAPY rose 0.04 to 0.32. Food Network’s RESTAURANT IMPOSSIBLE was at 0.31. On Syfy, FACE OFF ticked up to 0.31, and THE INTERNET RUINED MY LIFE was up 0.04 to 0.14. 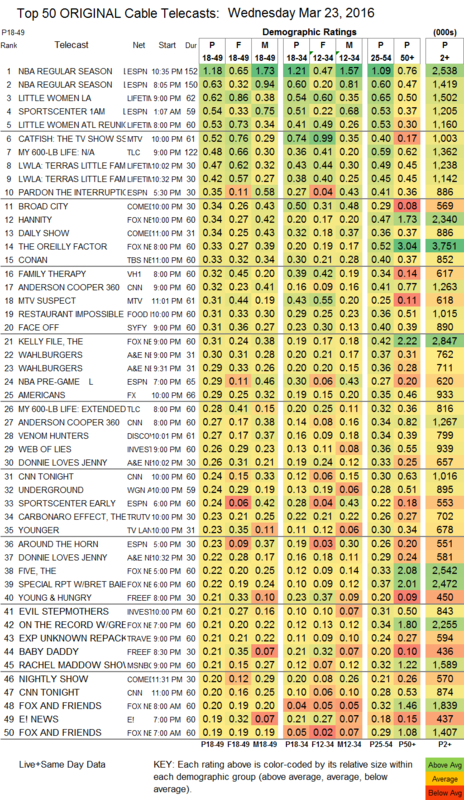 On A&E, 2 episodes of WAHLBURGERS were at 0.30/0.29 compared to last week’s 0.34/0.33, and 2 episodes of DONNIE LOVES JENNY were at 0.26/0.22 compared to 0.29/0.25. FX’s THE AMERICANS added a hundredth to 0.29. Discovery’s VENOM HUNTERS fell 0.05 to 0.27. WGNAmerica’s UNDERGROUND was down 0.03 to 0.24. The season finale of TV Land’s YOUNGER was down a tick to 0.23. 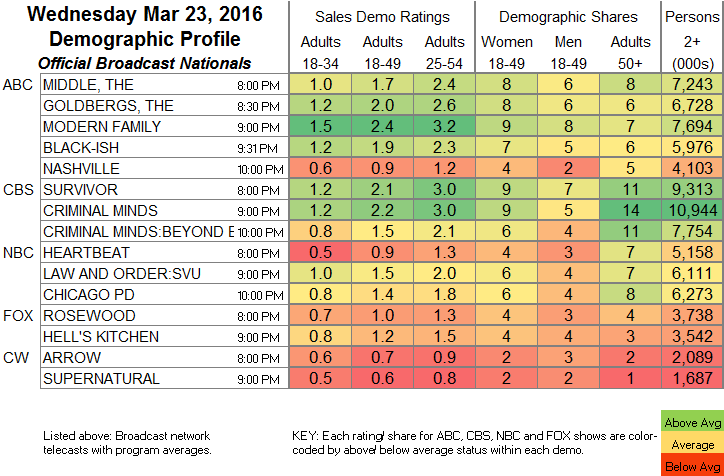 On Freeform, YOUNG & HUNGRY fell 0.05 to 0.21, and BABY DADDY was down 0.03 to 0.21. POP’s SCHITT’S CREEK lost a tick to 0.05. On El Rey, LUCHA UNDERGROUND doubled to 0.06 in its first hour, then held at 0.02/69K in the 2d. Sundance’s HAP & LEONARD was steady at 0.04/208K.